Delicious appetizer at served table in restaurant. 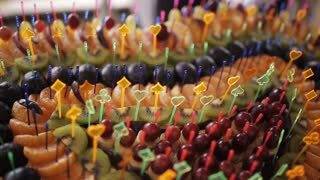 Served table with various snacks, canape and appetizers. Beautifully decorated catering banquet table. Canape with cheese salami and olives. Close up. Canape with cheese salami and cucumber. Close up. Canape or crostini with multigrain crispread with cream cheese and fresh fig slices on a wooden board. Delicious appetizer ideal as an aperitif. 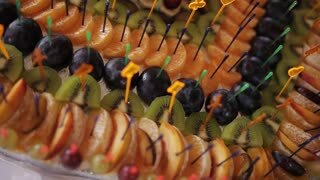 Snacks and canape on buffet table at event. Appetizing snacks on party table at holiday evening. 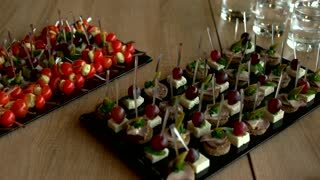 Delicious snacks and canape on table at event party. Close up appetizing snacks on party table at holiday evening. Salmon and creamcheese puffs . holiday snack catering. Profiteroles or canape. Canape of meat, cheese and seafood at the feast. Canape of cheese and salami at a party. Canape of olives, cheese and seafood at the wedding. Canape at the event. Wedding.